The use of a frequency converter system in a critical application requires careful coordination of the frequency converter with the induction motor along with a method to accommodate AC power line failures. The actual needs of the process must be known to select a frequency converter system that is properly designed and provides a reasonable payback period. These are typically LC networks connected in parallel at the source of the harmonics (in other words, at the frequency inverter input). They are tuned to just below the 5th harmonic (typically 280 Hz) and will tend to sink both 5th and much of the 7th harmonic. Obviously, they must be sized to the harmonic-generating load. This can be as simple as a delta wye transformer feeding one frequency inverter(s) and a delta-delta feeding another frequency inverter(s). There is a 30 degree phase shift effect between these two configurations, which effectively results in cancellation of harmonics at the closest upstream PCC (Point of Common Coupling). The cancellation effect is optimal when both loads are more or less equal. Practice in some frequency converter applications has been to specify and install a bypass that allows the motor to operate on line power in the event of a failure of the frequency converter. This paper will explore the history of the bypass solution, as well as the advantages and disadvantages of the practice of installing a bypass. A bypass can be supplied in different forms: 2-contactor, 3-contactor and a wide range of input devises and control relay logic. See figure 1, for a simplified single line power diagram of the two different types of bypasses. In each case the purpose of the bypass is to operate the motor via a motor starter in case of a frequency converter failure. In the case of a 3-contactor bypass the frequency converter can also be isolated so that the frequency converter can be serviced while the motor is running in bypass mode. The motor starter, or bypass, includes a contactor, overload and some type of power supply, usually a control transformer, that powers the bypass operation and relay logic. Although frequency converter manufacturers have no legal obligation to ensure their frequency converter modules meet the European Community's EMC directive limits, they have a vested interest in providing distributors, systems integrators and OEM's with frequency converter modules that can comply. Any party responsible for getting the final product CE certified for EMC will always insist on frequency converter modules which meet the EMC limits for their intended markets. Otherwise, the end user will force their suppliers to look elsewhere for a frequency converter which does conform. In most cases, OEMs and system integrators design and build multiple-motor industrial frequency converter systems to the tailored specifications of an end user. These systems are usually quite complex, involving many frequency converters which interface with other types of industrial control equipment. CE certifying such large systems for the EMC directive can obviously be arduous and extremely expensive. Inexpensive frequency converters use small IGBTs with fast switching times and simple filters. The fast switching times translate into an increased efficiency for the IGBTs themselves, but on the downside, cause electrical noise that can harm motors. Improperly filtered noise combined with long cables can cause motor problems and lower productivity. Choosing the wrong type of frequency converter for an application can greatly affect productivity. An example of this would be using a volts-per-Hertz inverter where the accuracy and extended speed range of a flux vector frequency converter would allow more consistent results. Also, incorrectly sizing a frequency converter can cause nuisance tripping and unwanted shutdowns. Peak overload and the frequency converter's overload capacity should be taken into account. Most frequency inverters today use pulse width modulation or PWM to create a variable output voltage, current, and frequency. Here, a diode bridge rectifier takes alternating current (ac) power from a power source and provides an intermediate direct current (dc) circuit voltage. In the intermediate dc circuit, the dc voltage travels through a low-pass filter. Then, six high-speed electronic switches in the frequency converter's inverter are controlled to create short pulses with the height of the dc bus voltage and of various widths. One caveat: Installing frequency converters at the working parts of a machine exposes them to more abuse. To address this issue, many newer frequency converters include better environmental resistance and ratings — for hot, cold, dusty, damp, sterile, and wash-down environments. Summarised is some of the basic criteria to successfully install a frequency converter. It is not totally correct to select a frequency converter according to motor capacity in "HP". It is better to choose a frequency converter based on the rated current of a motor. If the frequency converter and the motor have the same capacity size (HP), an increase in the number of motor poles reduces the efficiency and power factor of the motor increasing the rated current value. Over the years we have witnessed a variety of frequency converter applications in which the frequency converter was not configured correctly. The result was an expensive piece of equipment with no real benefits, and in some cases it actually caused harm and increased costs. We have also noticed a number of customers that were up-sold frequency converters with features that they did not need, which ultimately increased the purchase price of the frequency converter. Frequency converter prices have dropped considerably over the past few years. As a result it is often less expensive to implement a frequency converter rather than a conventional starter and a flow control valve. Many manufacturers are promoting frequency converters by offering an incentive. 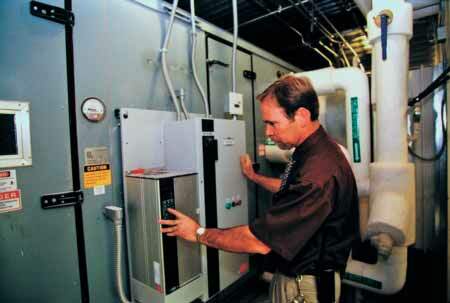 Incentives combined with the energy savings, often results in short pay back periods. Frequency inverter (aka frequency converter) has become increasingly popular in industrial applications, but they have their own problems in high-resistance-grounded systems. In many frequency inverters, the built-in ground fault protection will trip only if current to ground reaches a fixed amount such as 33 or 50 percent of full-load current. However, in a high-resistance-grounded system, the ground-fault current is limited to a small value (generally just a few amps) so the frequency inverter can never trip on a ground fault. This means that a frequency inverter should always be backed up with a ground-fault relay—but the ground-fault relay must be chosen carefully. 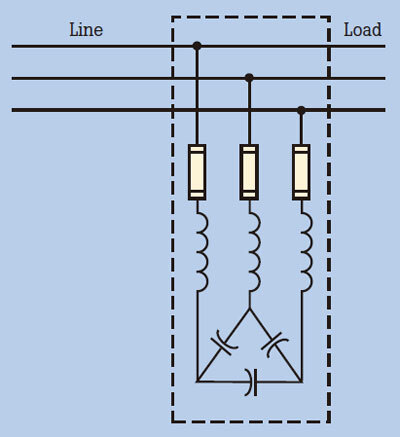 A conventional ground-fault relay detects ground-fault current at power line frequency (50/60 Hz) and above. Higher-end ground-fault relays filter high frequencies to prevent trips from harmonic noise. Some frequency inverter applications often operate from 120 Hz or more all the way down to 0 Hz (DC). Most ground-fault relays don't work at low output frequencies (below about 20 Hz) or DC. There are DC ground-fault relays, but most can't detect AC faults, so they can't be used with frequency inverters. The service department of a frequency converters manufacturer frequently sees the following scenario: A frustrated user calls with what he perceives to be a defective piece of equipment. As the technician begins probing for information, the user's frustration boils over, often with an exclamation along the lines of "what a piece of junk!" As the service technician asks the pertinent questions, the exasperated user relays the details of a frequency converter that is continually tripping on a fault until the user is at the end of his rope, not knowing what to do. Modern converters are a marvel of technology and can often be a bit intimidating to those unfamiliar with power electronics. With this in mind, let's examine the factors that can contribute to incorrect performance of a frequency converter unit with the assumption that the frequency converter still turns the motor correctly. When troubleshooting frequency converters, start with a thorough visual inspection; clean any dirt, dust and corrosion from the frequency converter; check all wiring connections for tightness; check line voltages and current coming into the frequency converter; and check the frequency converter output for voltage and current. If power is the primary concern, measure the power going into the frequency converter. This is considerably less expensive than measuring the variable frequency side. The frequency converter manufacturer should be able to give you an efficiency rating for the frequency converter. From this rating and the power reading, you can calculate the power output from the motor.